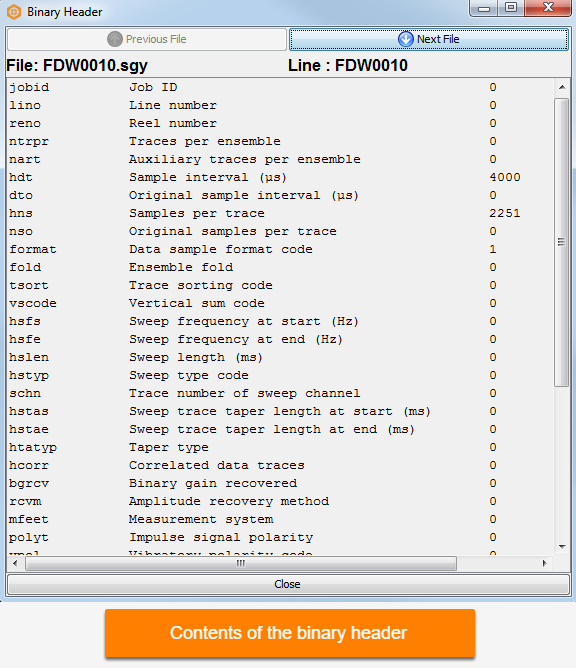 In the Specify the byte locations of headers window (see Remapping Headers) of the SEG-Y Loader, the following tools provide further information to help with the mapping. Click this to view useful information about the survey file. For the files that you are importing, the survey details including 2D line name, CMP, X, Y, number of samples, sample interval, first sample time/depth and vertical dimension are displayed. Click this to view additional information about the contents of the SEG-Y data file. Here you can find important information including sample interval and samples per trace. Previous line and Next line — If you are importing multiple 2D lines, click these to display the contents of each line. These buttons will only be enabled if you are importing more than one 2D line. Previous Traces and Next Traces — Click these to see the previous or next batch of traces. Jump — Click this to jump to a particular trace, and you can also define the number of traces for which the data will be displayed at Number of traces. Value ranges will be calculated where appropriate. 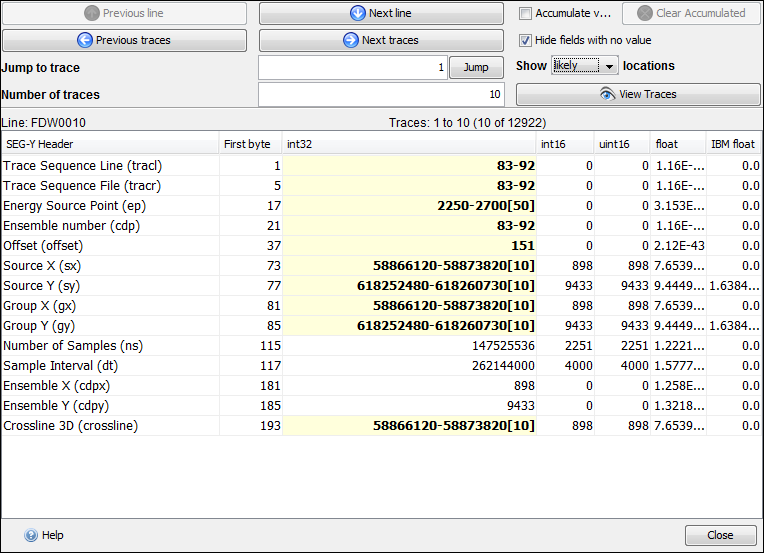 For example, if you enter a value of "10" for Number of traces and "1" for Jump to trace, you will see the data for traces 1 to 10 displayed in the table. View Traces — Click to display the data based on the headers currently mapped. Accumulate values — Select this check box to display accumulated values of the traces. Clear Accumulated — Click this to reset the data displayed on the screen. Show — Filter the displayed data based on the First byte column. Showing all odd will display only the odd values in the column, and similarly, showing all even will display the data on all the even rows. You also have the options from this field to show all, standard or likely rows for mapping in the dataset. 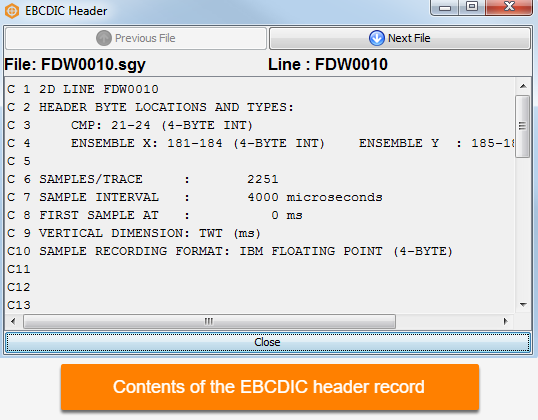 A quick way of assigning headers to the correct byte location is by opening the Trace Headers window and right-click on the appropriate byte location and integer format. Assign the field to the appropriate header from the list. The field will then turn light yellow. Headers that are crucial for the import of data into Insight are presented at the top of the Specify the byte locations of headers screen. You may want to expand the Advanced Mappings pane at the bottom of that window to remap other data within the SEG-Y file to their byte locations.